Over the recent months, the Japanese mass media have prioritised the topics with the key words like Okinawa and Futenma, which have considerable weight both within Japan and in its relations with its key partner, the USA. Let us remind you that the first of these words refers to one of the 47 prefectures of the country, as well as the largest island of the Ryukyu Archipelago which stretches for almost 1,000 km (almost reaching Taiwan) to the south of the 4 main islands of Japan. The exceptional strategic significance of the archipelago is determined by the fact that it serves as the front line in the military standoff between the US-Japanese tandem and China in the East China Sea, the Taiwan Strait and the South China Sea. The largest island of the Archipelago (Okinawa) is the place where the principal part of the US Marine Corps is located, staying on the Japanese territory in compliance with the bilateral Alliance Agreement. Its first version was adopted by the 2 parties in the wake of signing the San Francisco Peace Treaty in 1952, the final version is dated 1960. The Okinawans are stubborn people. They have a relatively short and controversial history (which dates back to the second half on the 19th century) of relations with the central Japanese Government. The same is true to an even greater degree with the “foreigners from the overseas” of today who occupied about 10% of the island’s fertile soil for the deployment of their military bases, which could have been otherwise used for agricultural purposes. Mainly this factor, as well as “side effects” (which are apparently unavoidable) of a high concentration of men (staying away from their homes or a very long time) create certain moods among the local population that can hardly be considered favourable for the US soldiers performing their duties. 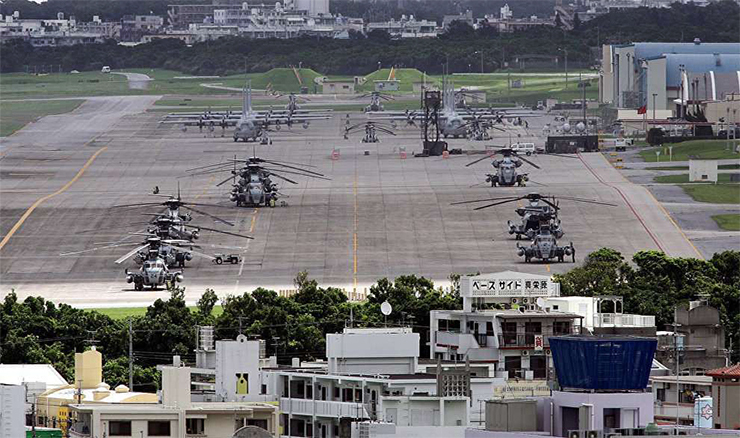 The US Marine Corps Air Station Futenma (MCAS Futenma) is facing an especially difficult situation. It is currently located in the very heart of the city of Ginowan whose population is approaching the figure of 100,000 people. The history of the base dates back to the summer of 1945 when, after the storming of Okinawa and during the preparation for landing on the main islands of Japan, the Americans built a runway near the small settlement with the population of less than 10,000. Great changes have taken place since that time regarding the size and population of Ginowan, and the presence of the modern military air base in its centre brings sheer discomfort. First and foremost to the city inhabitants who can watch the takeoffs, landing and flying of two-engined Osprey convertiplanes 200 – 300 m away from the residential houses and children’s institutions and over them. Naturally, incidents do happen. The latest incident (which took place in January this year) was an 8 kg detail falling in the schoolyard after it fell off the helicopter flying over the building. After that, the children were ordered to immediately take cover in the school building as soon as any aircraft appears in the vicinity. The very existence of the problem and the need for its resolution by relocating the Futenma base to another underpopulated place of Okinawa were mentioned in the US-Japanese documents of the late 1990s. In 2006, the place was finally approved by the Ministries of Defence of the 2 countries. It was the district of Henoko in the outskirts of the coastal city of Nago. Then long years of paperwork followed to arrange the allocation of the land plot for the future base, as well as various arrangements taking into account the demands of the environmentalists (the adjacent water area is a unique biological system). The project envisions building a coastal dam, filling the separate sea lagoon with construction waste, concreting the artificial land territory and finalising the runway construction. The work that was postponed many times was to begin in 2014. However, in November that year, the non-partisan candidate Takeshi Onaga won the Governor Elections with a great vote difference. He was a strong opponent not only of building Futenma 2 in Henoko, but also of the US military presence on Okinawa in general. The beginning of the work was delayed and the whole thing turned into a litigation of the Central Government versus the Okinawa Governor. The very nature of this litigation showed that the problem by and large and this specific conflict were intra-Japanese issues. The US (for the time being) remains aside and watches the situation unfurl, since the US headquarters will probably be satisfied by the status quo, i.e. maintaining the Futenma base in Ginowan. However, eventually, in case of further exacerbation of the issue of the US Corps presence on Okinawa in general, Washington can make Tokyo face an issue just as actual and way more critical, namely that of providing the appropriate conditions for the US soldiers at the US military base. At the backdrop of growing misunderstanding in the trade and economic and foreign policy (such as the issue on the Korean peninsula) areas of the bilateral relations, such claims are the last thing Shinzō Abe needs. That is why, quite predictably, the Japanese Government managed to win the legal proceedings at all the levels (including the Supreme Court) and, as of April 2017, the construction work in the district of Henoko has been underway. Judging by the recent photographs, the lagoon has been won back by building concrete barriers (approximately, judging by the pictures) at a distance of 200 – 300 m away from the sea shore into the sea. That is, the work is approaching its final stage. However, on July 27, the Governor Takeshi Onaga re-emerged and departed 10 days later, he had been diagnosed with pancreatic tumour in spring this year. In his last political message, he stated that he was going to recall the authorisation for allocating the land plot for building the Futenma 2 base which had been granted by his predecessor occupying the post of the Okinawa Governor. The Act revoking the permission was implemented by the Prefecture Government on August 27, i.e. after the death of Takeshi Onaga, thus ensuring the execution of his political will in a symbolic way. The Central Government decided to take a pause, apparently until the end of September, which is not a critical delay in implementing projects of such scope and significance. The thing is that the new Prefecture Governor Elections are scheduled for September 30 this year and the ruling Liberal Democratic Party will probably support the incumbent Mayor of Ginowan Atsushi Sakima. Atsushi Sakima advocates eliminating the US base from his city, but supports its relocation to Henoko. For the time being, his chances of becoming the new Okinawa Prefecture Governor are estimated as very likely. Electing Sakima would expedite the resolution of the complementary issue in the relations with the key ally for the Japanese Government. There are enough issues without Futenma, as we already mentioned. All of them are to be discussed at the coming (8th by count) meeting of Shinzō Abe and Donald Trump in New York scheduled for September 25, according to the Kyodo media agency. It is to be held under the auspices of another UN General Assembly where the Japanese Prime Minister is going to give a speech. Apparently, the Governor Elections on Okinawa will take place after the event. However, let us repeat, the Central Government has legal grounds to resume the work in Henoko after the decency pause on the occasion of remembering the late Governor without waiting for the Okinawa Elections results. And the typhoons will be over by that time as well. Everything will depend on what is more important for Shinzō Abe at the moment: to hold a new round of negotiations with the key ally country President on much more important issues of the bilateral relations without the burden of responsibility for the uncertainty around one of the US bases on Okinawa; or to prioritise the increasingly burning issues of the domestic political life whose main topic is gradually switching to the coming Parliamentary Elections next year? The second option is stipulated by the country’s Prime Minister respect for the feelings and moods of the electorate. Including the stubborn Okinawans. Thus, we are going to watch the rather notable events concerning the Futenma base which have already become the longest lasting political soap opera in the intra-Japanese and the US-Japanese relations ever.